Plans for a seven story 129,724 square foot apartment building on S. Johns Place have been filed with the Department of Buildings, of which 83,789 will be residential and make up 122 apartments averaging around 650 square feet per apartment. 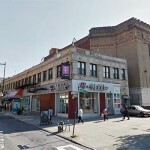 Filed on October 28th, building plans show that the owner of the property located at 1040 S. Johns Place between Kingston and Brooklyn Avenues seek to enlarge the single story building – which currently is occupied by a Rite Aid pharmacy – to a seven story mixed use building. 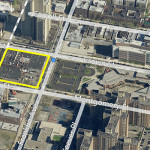 Plans call for 9,001 square feet of commercial space on the first floor, 29,285 square feet of community facility space on the second floor and 83,789 of residential space on floors 3 through 7 across 122 apartments averaging around 650 square feet per unit. Pluming plans reveal that all the apartments will have a kitchen with a single sink, a single bathroom and no hookups for washers and dryers. There will be four hookups in the cellar alongside 61 bicycle parking spaces and storage closets. A total of 69 car parking spaces will be available in the existing parking lot, which is less than the 85 spots required by the curent zoning code. One of the names on the filing reveals that the developer behind the project is Soft Stone Development, a Borough Park-based firm affiliated with controversial investor Chaim Miller reported TheRealDeal. Speaking to New York YIMBY a representative from the developer said that they intend to build above the drug store instead of demolishing it. 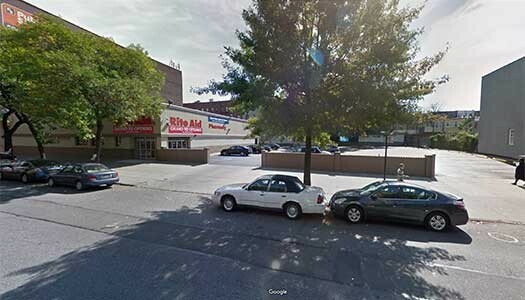 They speculated that reason the developer is probably choosing to preserve the Rite Aid because the property isn’t zoned for commercial use, and it would be difficult to replace the retail if it were demolished. Owner of the building is 1040 Properties LLC, which is a cooperation controlled by Dovie Sperlin, who purchased the property in 2004 for $1,875,000. Sperlin owns dozens of properties in and around Crown Heights, with the number of apartments tallying in the thousands, many of those properties were obtained for little to no cost through renewal and revival programs devised by the City of New York for low income residents. So now not only do we have outsiders coming into our neighborhood building apartments for the yuppies, now we have our own to thank. What frum family in their right mind will be moving into an apartment that’s a measly 650 sq feet. So what do we do about this??? Why is it ok that all these government subsidized programs go into a project like this but it is not helpful to the community? Call your politicians, arrange a town hall meeting, what else? PLEASE post names, phone numbers, email addresses etc. HERE. Let’s INSIST that a project like this should benefit the community. The highest rents in Crown Hieghts are in the Sperlin buildings. They set the trend for all the other landlords. Dovie Sperlin is a scoundrel! He stole – YES STOLE – his fortune from the community and I am hard pressed to believe he ever made an honest dollar. Fair housing? I wonder what his rent ratios are and how much goes to Jews? The amount of building he got from free while his brother was in the community council is obscene and the amount of money he has made off it… It all makes sense why he was in power for that long. But now he has sunken to a new low, lower then where his father stooped to, by importing this new wave of tiny rentals in the name of the holy dollar. Shame on you Dovie. Shame on you! This Sperlin/Junik/Wilhelm thing is nasty and horrible. There is a bad stench coming from these individuals. It is high time that our community organizations stop honoring these rodents. Time to throw Wilhelm out of Oholei Torah. All he does is count money, couldn’t give a dam about any of the students. Where were you in the 80’s and 90’s when no Lubavitcher would even think of crossing eastern parkway, while these very same landlords STRUGGLED to hold on to these run down buildings?. An ignorant community is a blind instrument of their own destruction. they may be insults but there is lots of truth to these insults – but I guess it is really not correct to shame anyone. Maybe the article has right facts and maybe not. Did anyone posting bother to approach Sperlin and ask before posting? We are currently living in the Borough with the fastest appreciation in property values and rents in the nation! For most of us it is unfortunate, as many of our families get priced out. Rent laws in NYC are quite strict, and landlords can’t just do whatever they want. Unfortunately, rather than work in unison and cooperate to build this Shechuna, we are busy with senseless Machlokes. Let’s take a cue from 20 of Cheshvan, study Hecholtzu, and take it to hart. For Dovie and developers of his ilk size matters… the smaller the better. For a single bedroom 600sf apt they can get upwards of $2,200, but if they enlarge it by couple of hundred sf the amount they can rent it out for only goes up slightly. Its simple economics… All hail the mighty dollar… All hail the holy Sperlins. A businessman can do whatever he wants. You want him to make less money out of charity? Does he tell you how much tzedaka to give??? Why all the wining Dovi Sperlin is not a bad guy, we need to encourage him and ALL the landlords and developers in crown Heights to also build housing targeting the frum market. this is currently a nationally owned chain store.. how does yuppy housing affect you ? north of eastern parkway those with insight could have bought homes for pennies 10 years ago . you have noone else to blame but yourself. doesnt mean sperlin family doesnt have to answer for all the housing they effectivly stole from the community however in this case..
After all is said, and done, the ONLY Lubavitch landlord insistent on helping our own is Dovid Fischer. I agree with #12 make it housing for frum families with kids. Everywhere one turns there are no options for people with more than 2-3 kids!!! !